Fitness Center in Hutto, TX:Why You Should Try Group Fitness Classes Today! Why You Should Try Group Fitness Classes Today! Beginning a fitness routine is hard, especially if you’ve never been active. A great way to get acclimated to working out and learn about the gym is to try group fitness classes. MVP Transformation Fitness in Hutto, TX, offers the best fitness classes. Contact us today! No thought required. This benefit to group fitness classes is often ranked number one by those who love them. We often do enough thinking and planning throughout our days that the last thing we want to think about when we work out is what to do. With group fitness classes, you leave all the thinking to the instructor, and all you have to do is show up and follow along. Accountability. Another top-ranking benefit to group fitness classes is accountability. If you go with a workout partner, you can’t skip the class if he or she is going. Furthermore, often the instructor will know your name, and if you miss class, he or she will ask why. Saying something like, “I didn’t feel like going,” will often result in a severe frown and look of disappointment on the instructor’s face. Pushed more. When you’re in a group setting, some competitive drive that we all harbor asserts itself, and you end up working harder just because you wanted to get in one more rep than the person standing next to you. Group fitness classes will help you to work harder and thus get a more effective workout. Proper form. When you’re a beginner to fitness, you don’t necessarily know how to do a squat correctly or a bicep curl. The group fitness instructor’s job is to model proper form and correct yours, which can be more comfortable in a group fitness setting. Variety. At MVP Transformation fitness, we believe variety is the key to any fitness routine and helps you not get bored and stick with your commitment to a healthier you. We offer a variety of group fitness classes, so you can tailor your interests. We offer Zumba, a fitness class that incorporates dance elements that will burn a ton of calories, as well as martial arts and boxing inspired classes, High Intensity Interval Training (HIIT), and yoga inspired classes. Fun! Group fitness classes are fun. They are different every session, and besides getting fitter, you’ll enjoy the music and the people who inspire and encourage you every step of your fitness journey. MVP Transformation Fitness in Hutto, TX, is the best fitness studio. We offer personal training sessions, nutrition coaching, dynamic fitness classes, strength training, and encouragement. We understand that getting fit and staying healthy is not easy, and we’re here to support you in every way we can. With years of experience, our fitness trainers are passionate about helping you achieve your goals. 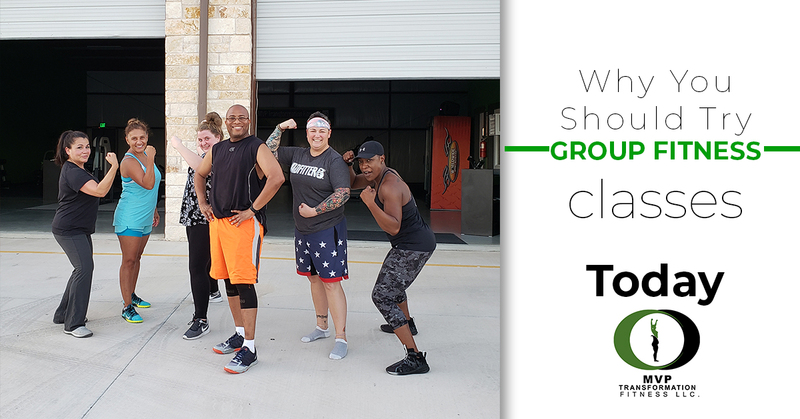 We offer a free, seven-day fitness pass, so you can try out our fitness studio or our amazing group fitness classes, and decide if MVP Transformation Fitness in Hutto, TX, is for you. Contact us today to get started!